I participated in a campaign on behalf of Mom Central Consulting (#MC) for MedImmune Specialty Care. I received a promotional item as a thank you for participating. I don't know about your house, but here we've been "enjoying" the lovely germs. Okay, I hope you've noticed the intended sarcasm... because really, I hate this time of year. It always seems like someone in my house is sick (it's probably just a numbers thing- just more likely to have at least one out of 10 people be sick at any given time). The truth is, Fall and Winter are times when people are closer together (inside, because of less desirable weather; inside for school; more shoppers in the malls; more family togetherness for holidays, etc). This means there are more germs around us all. There are things we can do to help prevent illnesses, especially the flu. My family does receive the flu vaccine each year. Last year a second grade girl in our town died from complications of pneumonia following the flu. To be honest, I don't think I will ever forget last winter when this happened...and I don't think I will be able to ever skip a flu vaccine for my children in the future. While I know not everyone agrees with vaccines, I personally can't justify not getting a vaccine that may potentially save my child. I know those parents who have lost their children would do anything to go back and get the vaccine. There isn't anything that is ever 100%, but I do feel more safe when my children are vaccinated. Of course, vaccinations are only one part prevention. Hand washing is so important (not just to prevent the flu, of course). Even when hands aren't visibly soiled they still carry germs. When I took my CNA class I remember getting special powder put on my hands, and then we were told to wash it off. I was pretty amazed that there was a lot left after what I considered to be decent handwashing. Using the birthday song is very helpful to gauge how long you should wash, but you should also keep in mind that those cracks and crevices (and under nails) need to be scrubbed, too. It's important to wash hands well and teach children to do the same. Capturing the germs is also very important. By letting those germs fly, you are letting those germs get to others. So be sure to cover that cough (and sneeze)! We cough into our elbows or shoulders here, since they are less likely than our hands to pass on germs. Toss away tissues you use, and wash and/or sanitize your hands after. 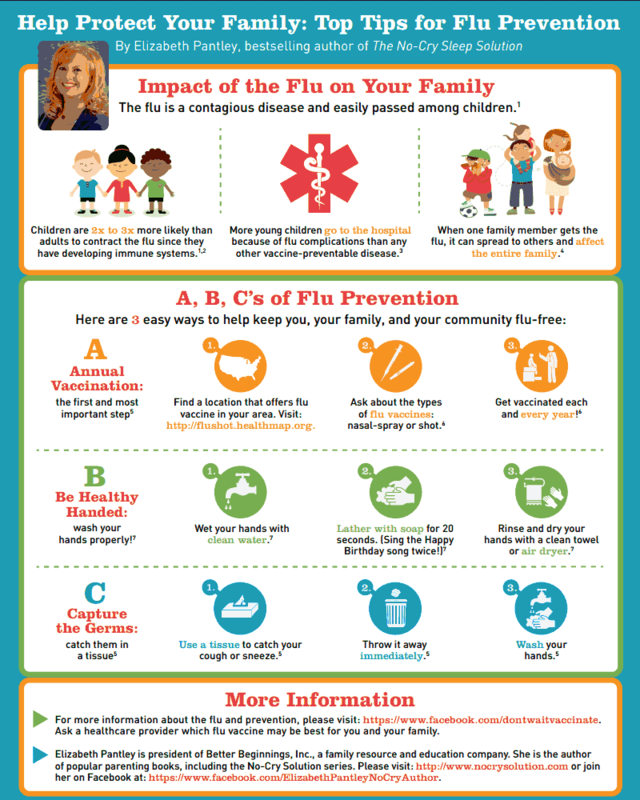 Be sure to check out the free eBook by Elizabeth Pantley for tons more great information on the flu and what you can do to prevent getting ill. I got flu shots for me and the kids. My husband refuses to get the shot but I would rather try to prevent myself from getting sick. I have enough to deal with without getting the flu.